A few years ago, I met a blind lady and her service horse at an Expo we were doing. Calie was overweight. Mona asked me to train Calie, targeting a diet and exercise program. Calie lost weight and became fit. Calie learned to drive. Mona learned to drive Calie. I developed an even greater appreciation for turning so-called human disabilities into abilities and new skills. These “hows” I now incorporate in all my training and coaching. I was one of those who believed it was idiocy to expect a horse, with its natural flight instinct, to ever safely guide a blind person. But I was forced to change my opinion, as I watched Mona and Calie work together. That convinced me of the value of service horses. And it intrigued me so much that I decided, working first with Mona, and then with Dianne and Penny, to learn to train service horses; to develop yet another set of personal training skills. I’ve used those skills with donkeys, too. The first were standards, Arwen and Jupiter, whose “mom” was planning her second back surgery. Dee wanted to spend time with them. And she needed to be safe while she was with them. We accustomed Arwen and Jupiter to the walker Dee used. We taught them to walk in tandem, on either side of a person. We taught them to allow a person, walking between them, to lean on them, as they all walked together. We also made sure Arwen and Jupiter came when they were called. 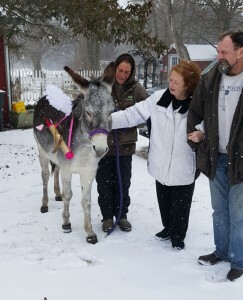 Dee can now navigate around her farm in places a walker just can’t go. She can rely on Arwen and Jupiter for physical support. I’m still learning, everyday, how best to mold horses’ and donkeys’ natural talents and instincts to prepare them to be human helpmates. Each human and equine student teaches me new things. And teaching them always reminds me of a giant picture puzzle. Even when we know what the final picture should look like, there’s no way to predict the order in which the pieces are going to fit together. 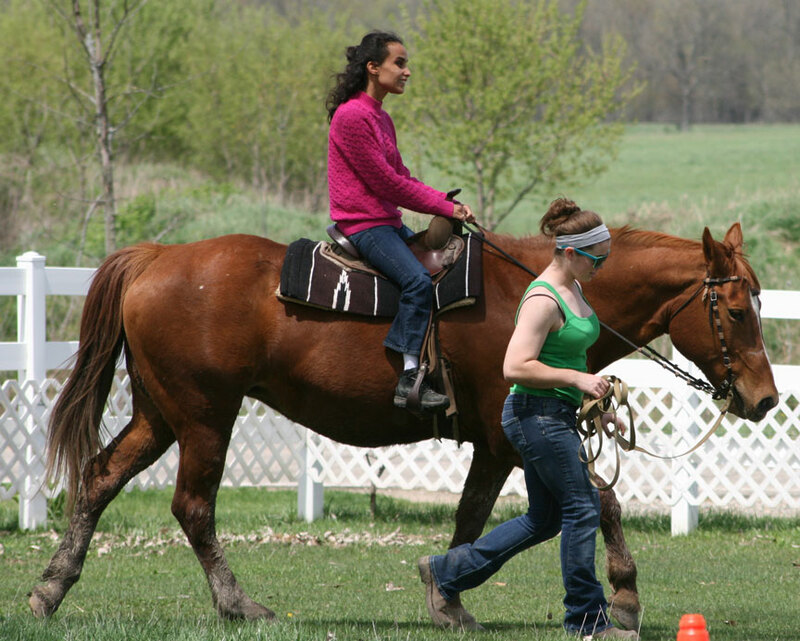 To date, we’ve trained our own Fortune, Ayla, and Precious to be guide horses for the blind. These miniature mares also pull wheelchairs and respond to a host of human conditions that compromise a person’s sense of balance. They’re multi-talented. Fortune and Ayla are eager to meet the needs of the specific people who will select them to respond to their specific circumstances. 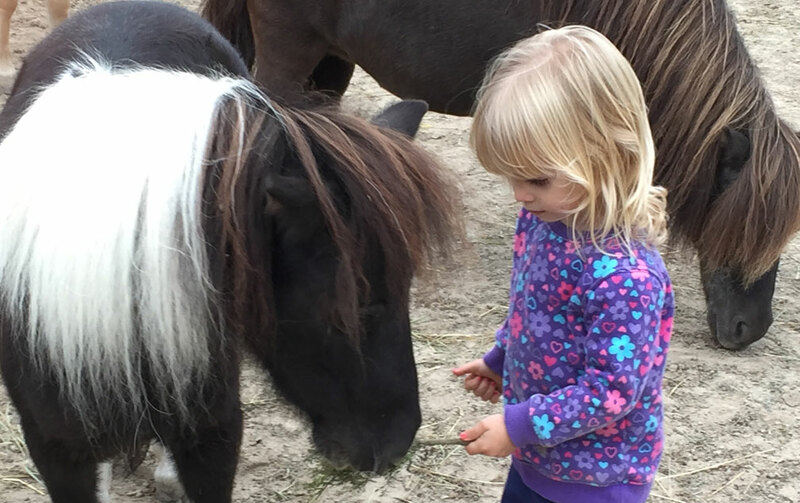 At M&MS FARMS, we keep fine tuning the way we work with our horses and donkeys, so they welcome the opportunity to make a difference in people’s lives. Our horse or donkey or yours. A helpmate for emotional support or physical assistance. Life is indeed a journey; not a destination. All we have to do is be open to the possibilities; to try new things. Looking for a service horse or a service donkey? Call us!